Even though I am not technically calling this a “Slimmed Down Sensation” it is a healthy low-fat dish and it’s definitely not lacking in the flavor department. 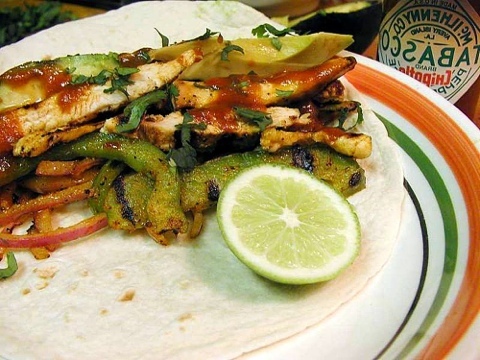 This recipe is a little different from other Fajita recipes that I’ve come across which require a marinade. This one is like the pre-packaged mixes you get at the grocery store…only better because you know exactly what is going into it and there is not as much sodium. This is a great weeknight meal that tastes great, but requires little effort….guaranteed to please the entire family. Prepare the seasoning mix ahead of time and pull it out when you need a quick meal! Add chicken and cook until internal temperature reaches 180 degrees F. About 10 minutes. Meanwhile, prepare the Fajita Seasoning by mixing the cornstarch, chili powder, salt, paprika, sugar, bouillon, onion powder, garlic powder, and cayenne pepper in a bowl. Once the chicken is cooked through, add 1 cup water and seasoning mixture. Stir well and bring to a boil. Reduce heat and simmer for about 7 minutes, stirring frequently. Add the green pepper and onion. Cook for an additional 3-5 minutes or until vegetables are crisp tender. Serve on flour tortillas with Mexican style shredded cheese, if desired.